One of the main challenges in protein chemistry is the ability of designing proteins with a target structure and function. In the collaboration with the molecular dynamic group at the University of Groningen we are aiming of using advanced chemical and biochemical techniques to design nanopores and artificial transmembrane proteins. The aim is to design an artifical protocell bottom-up, and to provide next-generation nanopore sensors for single-molecule analysis. We have recently shown that proteins can be internalised inside a ClyA nanopore and the binding of ligands to the protein can be measured. Crucially the nanopore system can identify and quantify the ligand directly in blood or sweat. The project has two aims: 1) The identification of several proteins that can be internalised inside the nanopore 2) The modulation of the binding affinity of the internalised protein to recogne the ligand at physiological ligand concentrations. The large-scale study of the proteins produced by an organism, proteomics, is crucial in order to understand cellular processes underlining diseases and to identify specific indicators linked to diseases. This project aims to develop a new platform for protein sequencing using nanopores. This will be the first technology that will be able to identify and sequence proteins at the single-molecule level. 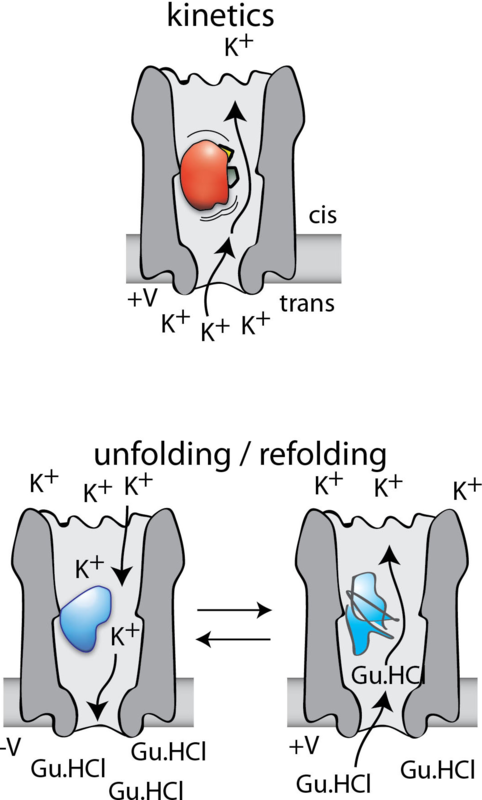 Unraveling the role of protein dynamics play and understanding how proteins can fold are among the last remaining grand challenges in enzymology. We are aiming at using biological nanopores to sample the conformational dynamic of individual native proteins and the folding unfolding of proteins at the single molecule level. The candidate will study important enzymatic reactions such as the dihydrofolate reductase or the adenylate kinase to underpin the importance of conformational dynamics in enzymatic reactions. Further, the protein will be immobilized inside the lumen of the nanopore and the folding-unfolding of the protein will be monitored by nanopore currents. Are you interested in the design and engineering of nanopores? Masters projects are available for motivated students that are willing to engage with our research projects. Successful applicants will receive an addition income from the University. The CSC scholarship will be topped-up so all bursary PhD students have a monthly income of ~1,700 euro.